Nikko Golden Eagle 5000-1, O/U TRAP 12ga, 30", F/IM CLEAN ! Description: GOLDEN EAGLE model 5000 Grade I TRAP O/U 12 ga. 30" barrels choked Full/Imp Mod. (.034”/.024”), .729” bores, 11mm wide vent rib, hard chromed bores & chambers, 2 3/4” chambers, standard forcing cones, Bradley white front sight, white mid bead. Blued receiver with moderate scroll engraving & gold eagle head overlay on both sides, gold mechanical single selective trigger, auto ejectors, non-auto safety/selector. Beavertail forend. 1” thick red Pachmayr trap for 14 3/8" pull, 5/16” RH cast, 1 5/8” x 2 1/8” comb drops, gloss poly finished lightly figured wood. 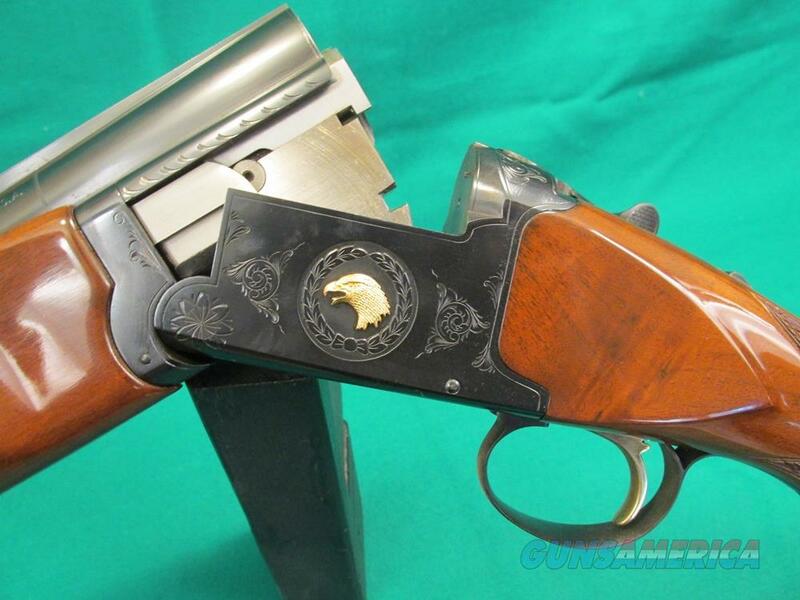 99.5% overall condition – a really clean example of this fine gun. Factory clamshell hard case. 8 lb. 2 oz. S/N N397783. Nikko shotguns were made in the same factory as the Winchester 101, and have a very similar design, and equal quality. Gun must ship to your FFL dealer. 5-day inspection period begins on arrival at your dealer; return refund is given if item is materially misdescribed, or has significant hidden flaws not disclosed. NV residents subject to sales tax. Shipping is by FedEx ground, or UPS ground, at my discretion. If faster service is desired, contact me for options and costs.